Selecting the best Economy Class seat can be confusing, and we try to provide tips and assistance. This section focuses on medium and long haul flights, normally airline trips of 5 or more hours, using widebody aircraft (an aircraft with two aisles). More airlines now offer the option to pay and reserve your seats online, either at the time of booking, or when you perform online check-in. This is the safest way to try and get the seat of your choice, but please remember that this is certainly not always a guarantee that you will receive this seat on your flight! Front, Middle or Rear of Cabin? This is a matter of personal choice, but on widebody aircraft you will generally find that the front of the Economy cabin is the quietest, normally just in front of the aircraft engines. The rear of the cabin tends to be noisiest from an engine noise perspective, and this also tends to bump around more during turbulence – of course, on less than full flights, you normally find that there are more empty seats at the back of the plane where you can spread out. For the meal services, it is difficult to suggest where you are more likely to be offered the full choice of meals before they run out! Some airlines start meal services from the front of the cabin, some the middle, and a few from the back of the cabin! Aisle, Middle or Window seat? In most instances, the least preferred seat is the middle seat – especially on those airlines where the centre section of cabin seating might provide a 5 across layout – so if you draw the middle seat, you have to ask two passengers to move each time you want to stretch your legs, use the washroom etc! If you want to get on the flight, and sleep with as little disturbance as possible, then a window seat may be the best option – you also get the outer cabin wall to lean against, rather than falling asleep on your fellow travellers. Remember however that the cabin walls on some aircraft have more curvature than others, and the window seat can feel as if it has less shoulder-room that ordinary seats. The aisle seat gives you easy access to walk around, but worth remembering that you might be getting up and down for your fellow passenger seated next to you. The aisle seat positions can also be prone to knocks and bumps as passengers walk past or try to squeeze past service carts in the cabin – you often find out in an aisle seat how inconsiderate some fellow travellers can really be! An Exit Row or Bulkhead seat? Most airlines now charge an additional fee to sit in the exit rows, others will allocate at check-in (remarkably some airlines still favour these seats for much taller passengers!). You do get a lot more legroom in an exit seat, but on the downside there are a few points to remember. You will not be allowed to keep any items of hand-luggage (even books etc sometimes) by your seat/footwell area during landing and take-off periods, and as the bins above your seat may be full by the time you realise, you will have to hope for a cooperative cabin crew that will take these items off you at these periods and return them after take-off and landing! Also, the exit row seats will not have a PTV entertainment screen on the back of the seat in front (as most seats), but will have the video screen stored in the armrest – similar for the meal tray table which will be stored in your armrest. 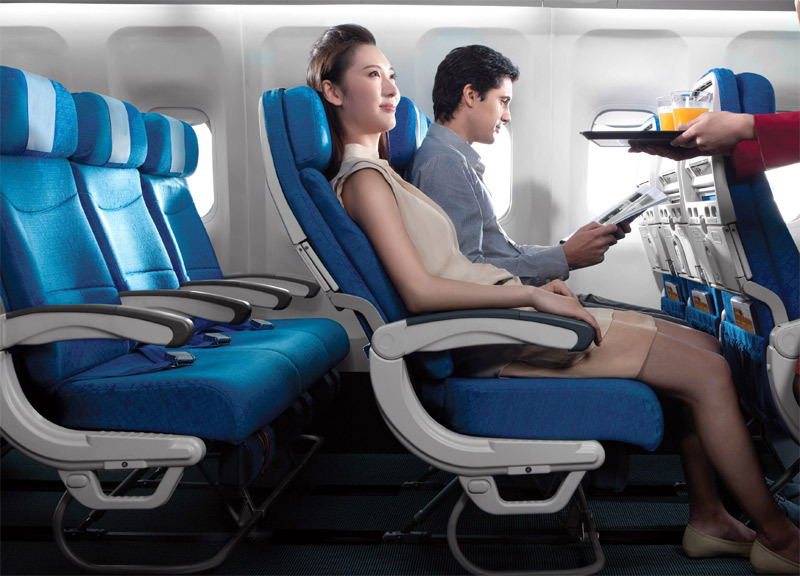 Because of this design layout, you might find that the actual seat width is less than ordinary seats, and it can be quite cumbersome using the PTV and tray tables – guess it is a case of measuring that against the benefit of extended leg space you will get. Bulkhead seats are are located immediately behind a solid cabin divider (on the PLAN below, Row 30, seats D/E/F/G/H/K). This is normally the location where a Bassinet is provided for families with babies, so can be noisier. Whilst you have no seat reclining in front of you, the legroom may at first seem spacious, but you will find that stretching your legs is not possible like in an ordinary seat. Bulkhead seats also suffer the fact that your tray table will be in the seat armrest, and this be cumbersome when left with a finished meal tray for long periods of time. Another important point with the extended space around the exit rows, is that on some flights you might find that passengers from elsewhere in the cabin decide that this is a good place to congregate and chat, do their stretching exercises etc, and it can therefore prove a rather busy place. It is also always worth watching out for those middle seat rows in the aircraft that look like there is a lot of legroom – this might be the case, but you can find that your hoped for space in front is being used as a cabin cross-over passage, as passengers go to the washrooms etc. Avoid the Toilet and Galley areas! Aside from the obvious fact that being seated next to or right behind the toilet can result in unpleasant odours etc wafting around you, the toilet flush is extremely noisy on most aircraft, and you will find this incessant noise interruption very annoying after several hours of constant repetition. During the darkness / sleep periods you might also tire of the light intrusion every time passengers open the washroom door – and similar to some bulkhead/exit seat positions, you will find that there are often a lot of passengers milling around your seat area as they queue for the washroom. Being seated next to or opposite the Galley areas can also be a bad choice – you will find that the level of pedestrian traffic (cabin staff and passengers) is much higher, the curtains may not always be kept shut so you get light intrusion, and as hard as staff might try, the preparation and clearance of meals will result in the galleys being quite noisy for these periods of the flight. On many long haul aircraft, some passengers will find that their footspace (ie the area under the seat in front) is impacted by the location of the control box for the IFE (inflight entertainment). This is something that is gradually being changed and improved by seat suppliers, but don’t expect quick results. Across many airlines, this IFE control box might be located in the aisle seat footwell area, although for some it is the window or middle seat that suffers – so, no hard and fast rules here. Airline seat pitch guides give you an indication of how much legroom you can expect. Economy class cabins on long haul flights generally offer 31 to 32 inches seat pitch (the industry standard), with a smaller number of airlines providing 33 to 35 inches of seat pitch. The higher the seat pitch, the fewer the number of seats an airline can fit into the cabin, so in present economic times do not expect to see airlines increasing seat pitch standards! It is important to remember that newer “slimline” seats do mean that a 32 inch seat pitch can offer as much personal legroom space as an older type of seat in a 34 inch seat pitch. With newer “slimline” seats being introduced by some airlines, the seat pitch dimension can become slightly skewed – a 32 inch seat pitch with a new, slimline seat may offer as much “personal” space as an older style seat in say 33 inch seat pitch – so the ruling is not infallible. Rows 38 and 47 are the main exit rows, so a lot of legroom, but in line with our earlier warnings, you might find the washroom and galley areas in close proximity to be something of a nuisance. Our team were unanimous in selecting seats A or C, H or K in Rows 31-34 on this aircraft. On the plus side, you are at the quietest end of the cabin, will be amongst the first to deplane at destination, and stand a good choice of getting the full choice of meals on offer. Toilets are all to the rear, so no odours or queuing passengers nearby. On the downside, if the bassinet seats in Row 29/30 are full occupied by families with babies, there is a chance of occasional crying etc – so a good noise-cancelling headset would be a must. Whilst cabin air circulation is different across aircraft types and airlines, our team also find that the air quality at the front end of the cabin is generally better, and less prone to the hot/cold temperature variations further back in the cabin. We hope that you have found this article of some assistance with your planning for an airline trip, and wish you an enjoyable flight – wherever you might be travelling or wherever you end up sitting! Many airlines include in their websites the cabin seat layout plans for different aircraft they operate. It might not be clearly linked from the entry page, but try looking up the FLEET or CABIN links if you can find those. Normally, that will help lead you to the most recent seat layout plans.